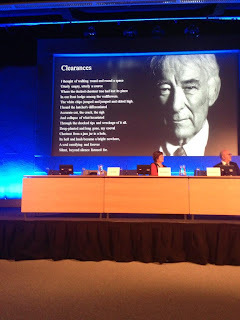 Last week I attended a conference in Dublin Castle for J.C. English reform. The conference centred around the Draft Specification for the new Junior Certificate English syllabus. I've broken this blog post into two sections to try and make sense of all that happened! Before entering the conference hall the day started for me by bumping into a colleague that I met at a conference last summer. This foreshadowed what was one of the major positives of the day, meeting and talking with colleagues. We swapped e-mails and ideas, see video below, and this collegial sharing of ideas happened throughout the event. Time should certainly be made for teachers to do this more. 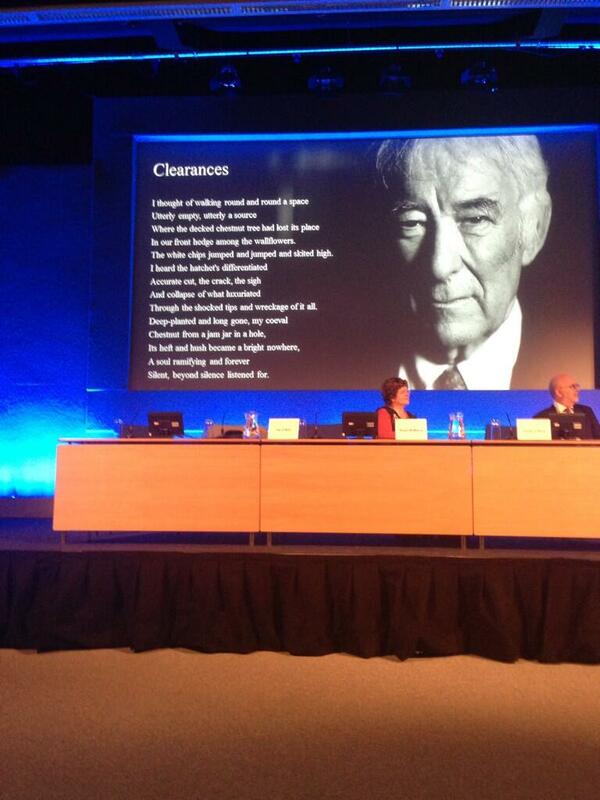 After we entered the conference hall and were welcomed, Seamus Heaney's 'Clearances' was read aloud. It was a great selection that captured the sudden sense of lost felt by those both coeval and of the era of the great poet. The keynote address given by Finian O' Shea was a tour de force of inspiration and insight. Mr O' Shea talked about different literacy types, learning styles , rights of the reader and much more. The only sour point of his speech was that that he didn't have time to speak longer. Delegates then broke into one of five workshops. I attended Fiona Kirwan's 'Planning for First Year English'. Fiona did a fantastic job of outlining what the Draft Specification is looking for in terms of planning. She talked in very honest terms about her journey in getting to grips with making a curriculum content plan for a first year English class that would match the needs of the Draft Specification. In short, across the three strands of Reading, Writing and Oral Language 59 learning outcomes will have to be met across the three years of junior cycle (More on that later). We were asked to discuss how the new system of specific learning outcomes might both help and hinder planning. The general positives were that the learning outcomes were varied and specific. The general negatives were that the system may be too rigid in design and that the sense of English as an Arts subject may be lost. I wondered how the new 59 learning outcomes system would fit within the overall Junior Cert. Syllabus' focus on both Statements of Learning and Literacy and Numeracy (More on that later). On the way to lunch, having quickly stopped and introduced myself to Fred Boss, I started to ruminate on the morning's events. Fiona's presentation had clarified many questions I had with the Draft Specification but perhaps not the problems. Over lunch with colleagues the consensus seemed to be that the Draft Specification was a 'done deal'. That the purpose of the day was not for consultation of the Draft Specification but about what nature and shape the upcoming workshops should take. In the afternoon I went to Kevin Cahill's workshop on 'Junior cycle English in the Digital Age'. On the way in I met Evelyn O Connor and in the workshop Fintan O'Mahony. An added bonus to any day. We were asked in our groups to broadly discuss what are the current possibilities for the digital world in the English classroom and what might be possible in the future? I was reticent to speak, unusually for me, to both the table and the group. I'm a technophile. No question. I tend to think of ICT use from the ground up in that I find a piece of software and think of ways it can help pupil learning. I was more interested to hear views from the table/room. There was a mix of responses from how people used an iPad in the classroom to 'what is a blog?'. To be clear, I'm not being snooty here. With the range of views and ability levels with ICT displayed at the table, in the room, this is going to be a major issue for the implementation of the new Junior Certificate syllabus (More on this later!) . This sense of uncertainty and insecurity at a major moment of technological change was perfectly captured by a video Kevin showed the room. In-service workshops for the new course are due to begin in October, so we'll have to wait and see what those encompass. I did think however that a consultation day would have been a good time to ask teachers what they feel is needed at these workshops. I would imagine that if the entire in-service program was constituted solely on work around how to assess the work of pupils it would not be time wasted. Equally, the same could be said for ICT, poetry, course design etc. The feeling I get is that this in-service program has already been designed. If I had to guess, which I will, I would imagine they are going to try and fit as much as possible in on the days we are there. I worry that on Day One of the new syllabus that not every teacher in the country, through no fault of their own, will feel comfortable and clear with the new course. That's quite the list! One figure that really stuck with me for the day was the 59 new learning outcomes that are in the new course. I agree with the group moderators that many of these are just making explicit what is already being implicitly done in the classroom. One immediate concern I had was that this will require much closer synchronization of curriculum content plans across the first three years. I know in my school a teacher will have a class for first year but then a different teacher will have them in second and third year. I think in practice departments will have to co-ordinate which learning outcomes are to be taught and when. This is not necessarily a bad thing but just presents yet another challenge to teachers to figure out under the new system. A point I raised on the day was how do individual courses fit within the broader Junior Certificate Syllabus. The new English course, for example, has 59 learning outcomes. How many will Geography/Science/Math etc. have? The new Junior Certificate course has 24 statements of learning. I asked, ''are these to be added on top of the 59 learning outcomes for English?'' The good news is no! I was informed that the statements of learning are embedded within the 59 Learning outcomes. ''What about Literacy & Numeracy?'' I barked like a 1920s New York journalist looking for the big scoop. I received the same reply, it's embedded in the 59 learning outcomes. I'm happy for the statements of learning to be embedded but to simply 'embed' Literacy & Numeracy would be an opportunity lost I think. In my school for the past year and half we have been trying cross departmental Literacy & Numeracy strategies. It has led us down a great path with all departments, for example, making the teaching of key words and cloze tests part of their teaching this year. Of course Literacy & Numeracy should be embedded in learning outcomes for all subjects but I think it risks getting 'left behind' again as an issue if it is not given a place of special significance in the new Junior cycle syllabus. How many will there be? How should they be corrected? Through what medium can they be delivered? There were answers but these felt like questions that were still genuinely up for consideration. Which is good. (A small point in passing here: Could the Personal Writing that is worth 6o marks be moved to the end of third year instead of Feb/March of Second Year? I quite like the idea of a pupil leaving third year with a physical/digital book that they have created. What ever the genre inside may be. It is also worth 60 marks, not the 50 of the other two) I wasn't at the workshop that was discussing the issue of assessment but it seemed a contentious issue on the day. My main concern around the area of assessment has always been how it may effect the teacher-pupil relationship. Leaving aside any conflicts of interest that may occur due to teaching a family member, child of friend, child of a colleague etc. there is, I believe, a conflict in trust between the teacher and the pupil. We're asked to act In Loco Parentis. I think, and I hope most teachers would agree, that the essential quality at the heart of a successful learning relationship is trust. Becoming both the trainer and race organiser will be tough. Continuous pupil effort to be formally rewarded by the teacher. Use of digital technology to be at the heart of teacher methodology and pupil assessment. Now welcome to Leaving Cert.! I certainly accept that there is a diversity of options available to teachers in the current Leaving Certificate syllabus that are not currently present at Junior Cycle. I'm also not naïve enough to think that change at both JC and LC level can take place simultaneously. But the gap between first year pupils starting the new English course in 2014 and their leaving cert course is 2017 does allow time for this conversation to at least begin in my opinion. One idea that I would propose, at even this early stage, is that any financial savings made by introducing the new JC syllabus be ring-fenced for the development of any future new LC syllabus. For example, if LC pupils also had three continuous assessments during their two years could the correction of those assessment be outsourced/state corrected? Especially if continuous assessments were to be submitted on a digital format. Travel and conference expenses could be greatly reduced/eliminated. Let's think big. Initial Change- Will we be able to say to a pupil that started school in 2014 that they received the same quality of course delivery that a pupil of 2018 received? That should be our bar for the roll out of this new course. Pupil-Teacher Relationship - We all know to be a teacher is a very privileged position. They'll have bosses in later life, that's not our job. Making a teacher responsible for the grading of 40% of a pupil's final grade fundamentally changes this dynamic in my opinion. I think at best it will introduce an element of wariness on the part of the pupil or at worst fear/confrontation. I believe this process involves so many people that are really trying to do their best for the future of our children. As always when dealing in large numbers of people, a consensus of opinion can be difficult to achieve. Having Finian O'Shea as the keynote speaker was just fantastic. I think it really resonated with the audience because we all felt relieved that someone with such insight and experience was being placed at the heart of the process. I also liked the speech given by Brigid McManus, NCCA Chairperson, at the end of the conference. She spoke with passion and sincerity about how teaching is not just a job, it's part of us. Changing our job as a result is essentially changing part of us. To say that large bodies like the Department of Education or NCCA don't have all the answers is right. To say that they don't care is wrong. This was evidenced by the insistence of each speaker at the end of the conference that there was still opportunity to leave feedback. As like many teachers I am also a parent. My daughter is due to start secondary school in September 2015. I like the shape of the new Junior Cycle course. I'm not sure what job awaits her in 2023/24 but I'm almost certain being able to regurgitate an essay on Hamlet won't form part of it. She'll need to be creative and think critically. She'll need to have strong Literacy and Numeracy skills. She'll have grown up in a digital world and she'll need to be ready for the brave new technologies of the future. I think the new Junior Cycle course has a better chance of doing these things than the old. There will be difficulties in implementing this new course but that doesn't mean we shouldn't. My one final wish is that, whatever shape the new course takes in the future, she'll have the room in English class to enjoy Hamlet because it's Hamlet. That it'll help her understand more about herself , not just prepare her for the work place.